Sometimes, cars that are mundane in their home country (or in a country where many were sold) are interesting in another, just for their ubiquity. Take the obvious – Corolla and Camry, boring. Toyota Carina or Crown? Mildly interesting, at least from a North American perspective. So for today we have a car that, while dead common in the United Kingdom (and probably many of its colonies), should at least be mildly interesting for anyone outside of its primary domain. 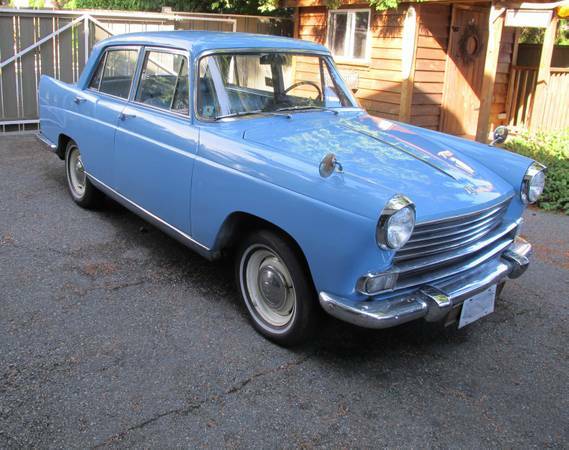 You can find this 1961 Morris Oxford Series V for sale for C$3900 in Tsawwassen, BC. Perhaps part of the appeal is the charming light blue color, which is much livelier than the usual dark greens, blues, and greys. Interestingly enough, while this design has a level of restrained elegance, the contemporary Vauxhall Victor featured here a while back looks like a pastiche of fifties American design cliches. This particular car is said to run well, and has been with the same family for quite some time. While there are some rust issues with the body, some of which can be seen on the rear wheel well in the picture below, it is hopefully not terminal. Oxford has to be one of the longest running automotive brands in history, surviving from 1913-1971. For 1959, the Oxford succumbed to a serious case of badge engineering, its styling consolidated with that of Austin, Wolseley, MG, and Riley. With bumper overriders, a clock, and leather seats visible, this appears to be a deluxe model. The car is said to be an absolute joy to drive, so hopefully that means it goes, turns, and stops properly. Of course, that means a top speed of 78mph and 0-60mph in over 25 seconds, so you might think about dropping in a 1.8-liter B-series from an MGB to give a little boost over the stock 1.5. 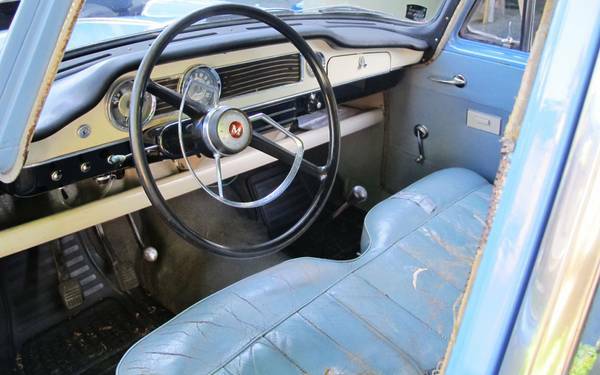 The interior looks presentable, though the leather will need some kind of attention. The design is nice and simple, though, and appealing, again in a more contemporary 1960s way – you might even say it looks rather Italian, which wouldn’t be far from the truth, since the bodies were styled by Pininfarina. Does a little slow with a lot of style work for a weekend touring car for you? This entry was posted on April 15, 2014 at 8:24 am and is filed under Feature. You can follow any responses to this entry through the RSS 2.0 feed. You can leave a response, or trackback from your own site.